Alfred Sisley original lithograph "Le Loing pres Saint-Mammes"
Medium: original lithograph. This impression is from the rare 1897 portfolio "Art et Nature" by Leon Roger-Miles, published in Paris by Boudet in an edition of 525. Printed in sanguine/brown ink on Marais wove paper, the image size is 5 1/2 x 8 3/4 inches (142 x 222 mm). The full sheet measures 9 3/4 x 12 5/8 inches (247 x 322 mm). Signed in the plate, not by hand. 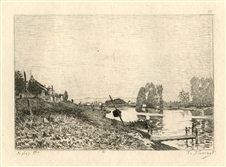 Alfred Sisley etching "Bords du Loing, pres Moret"
Medium: etching (after the painting). This beautiful piece was etched by Pierre-Marcel Roy after Alfred Sisley, and published in Paris in 1906 by Floury for the rare 1906 first edition of "Histoire des Peintres Impressionnistes" by Theodore Duret. Printed on cream laid paper, the image measures 5 3/8 x 6 7/8 inches (135 x 175 mm). Signed in the plate, not by hand. Condition: there is a printers crease near the top right, and a small tear at the bottom edge near the lower left corner (not affecting the etching). Alfred Sisley etching "La Seine a Moret"
Medium: etching (after the painting). This beautiful piece was etched by Auguste Lauzet after Alfred Sisley, and published in Paris in 1892 by Chamerot et Renouard, for the very rare volume "L'Art Impressionniste", featuring etchings after important artworks in the private collection of M. Durand-Ruel, which was at the time was one of the world's foremost collections of Impressionist art. This print is a fine impression printed on cream laid paper, with a platemark (not shown here in this photo) and good margins; the plate measures 4 3/4 x 6 inches. Not signed. A nice find, with no others currently offered on the market. 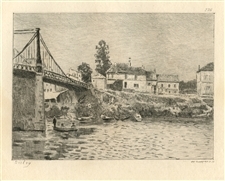 Alfred Sisley etching "Ile Saint-Denis"
Medium: etching (after the painting). 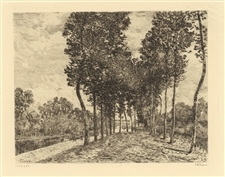 Etched by Flameng after the Sisley painting. Published in Paris in 1873 by the Galerie Durand-Ruel for the rare "Recueil D'Estampes Gravees a L'Eau-Forte" portfolio. This impression is on cream laid paper and the plate size is 4 1/2 x 6 inches (115 x 150 mm). In good condition with good margins; there is a platemark but it is not shown here in this photo. Plate-signed, not hand-signed.